The M8 motor uses, almost, one quart more Harley engine oil than its predecessor Twin Cam motor. The Twin Cam motor held approximately 3.8 quarts of oil while the M8 motor holds closer to 4.75 quarts. Before installing a new Harley oil filter, it is important to fill the filter approximately half way and wet the rubber seal with the new Harley engine oil. 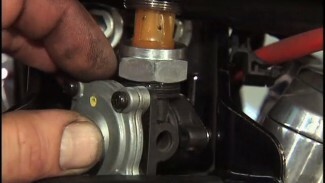 Spin the new filter onto the oil filter mount until seated. Then, find or create a reference point on the new filter and tighten the filter another 1/2 to 3/4 turn. Tighten the filter, only, by hand. Do not use any type of oil filter wrench during installation. When replenishing the M8’s motor oil, Harley Davidson suggests that you begin by adding four full quarts of Harley engine oil. At this point, you can perform a cold oil level check. 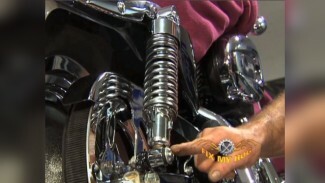 This is important to verify a safe oil level before operation of the motorcycle. 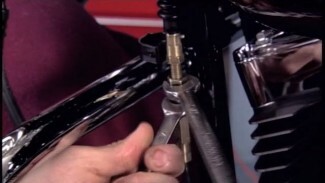 With the four quarts of fresh oil added and the oil fill plug installed, start the motorcycle and let it idle for a minute or two allowing the fresh oil to circulate through the system. Remove the fill plug / dipstick to check the oil level. The cold oil level is correct when the level is midway between ADD QT and FULL HOT marks on the dipstick. If the oil level is at or below the ADD QT mark, add only enough fluid to bring the oil level midway between ADD QT and FULL HOT marks. Now you can set your final, hot oil level. Ride the motorcycle until the motor reaches 200° F or higher, then park and let the engine idle for a minute or two. Turn off the engine. Remove the dipstick, wipe off, and screw the fill plug/dipstick back into the case. Now, you can remove the fill plug and read the dipstick to determine the bike’s current, hot, oil level. The Harley engine oil level must be between the ADD QT and FULL HOT marks. If needed, add more oil, but do not overfill. The oil level should never be over the FULL HOT mark on the dipstick. Check your oil level at every fuel refill.